Trypan blue dye has been used in various intraocular surgeries and its safety profile has been well documented.,, Anterior segment optical coherence tomography (ASOCT) is an efficient tool providing in vivo cross-sectional imaging and layer-by-layer analysis of corneal pathology. We report a case of inadvertent injection of trypan blue into the cornea by a trainee while attempting to stain the anterior capsule during routine cataract surgery and describe its ASOCT features. A 42-year-old female came with complaints of gradual dimness of vision for distance in her left eye since 1.5 years. Her best-corrected vision (BCVA) was 20/20 in her right eye and 20/200 in her left eye. Clinical examination revealed pseudophakia in the right eye and nuclear cataract with posterior subcapsular cataract in the left eye. Fundus was normal in both eyes. Patient was advised to undergo left eye phacoemulsification with posterior chamber intraocular lens (PCIOL) implantation. During surgery, instead of injecting the trypan blue (0.06%) (Sunways India, India) dye into the anterior chamber, there was accidental injection of dye into the corneal stroma, resulting in diffuse staining of the cornea with dye. As the visualization of anterior segment worsened, the surgery was deferred. In the immediate postoperative period, slit-lamp examination revealed diffuse stromal edema. 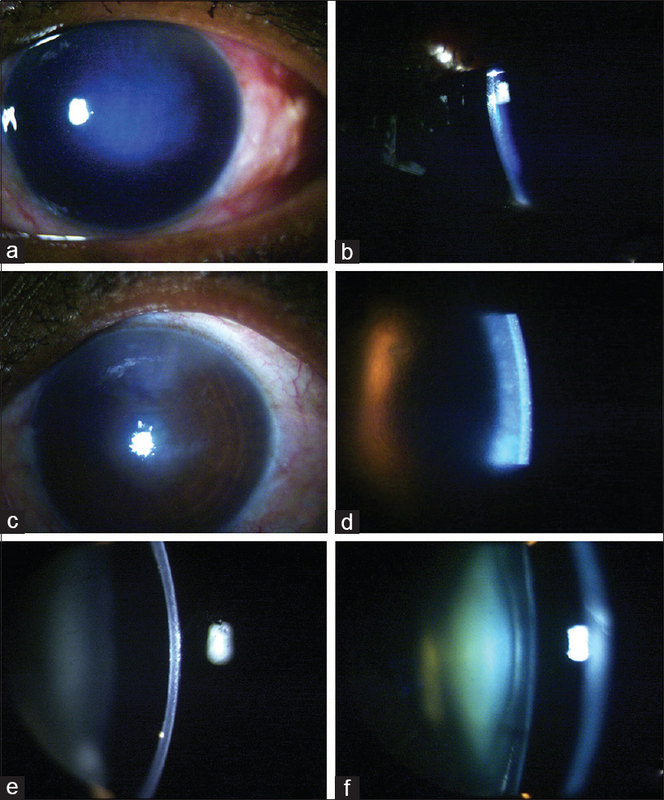 She underwent serial slit-lamp photography and ASOCT for documentation and follow-up of the corneal status [Figure 1]a, [Figure 1]b and [Figure 2]a. Patient was advised to use tapering dose of topical Gatiquin-P [gatifloxacin (0.3%) prednisolone (1%)] eye drops (Cipla, India). During her follow-up visit, corneal edema started decreasing [Figure 1]c, [Figure 1]d and [Figure 2]b. Over the next 7 weeks, the corneal edema completely resolved [Figure 1]e, [Figure 1]f and [Figure 2]c and the vision attained to the preoperative level of 20/200. The findings were comparable to the ASOCT (Optovue, Inc, CA, USA) showing separation of stromal lamellae in the early weeks and compact cornea at 7 weeks. The patient underwent uneventful cataract surgery after 2 months with PCIOL implantation resulting in a good surgical outcome with postoperative uncorrected distance vision of 20/20. In this case, there was an accidental injection of trypan blue into the corneal stroma. This could have happened due to multiple reasons like, faulty focusing of the microscope, poor stereopsis of the operating surgeon, lack of surgical experience, misdirection of the cannula during injection of trypan blue, use of blunt instruments, improper wound construction, and repeated maneuvering during entry through the side port. It is, therefore, imperative that every operating surgeon, especially in the early days of learning should assess his refraction, use appropriate spectacles if necessary, and be aware of his/her sense of depth perception. The microscope should be adjusted to the correct focus. Following precautions must also be taken like directing the needle or cannula downwards towards center of lens during insertion, ensuring complete insertion of the needle tip inside the anterior chamber prior to injection, making bi-valved side ports with adequate length (a very long wound shall cause difficulty in maneuvering and a very short wound shall be more prone to leakage), and finally using adequately sharp-tipped instruments. ASOCT is a novel technology at present that produces the optical biopsy of the cornea which gives us direct clue to the pathology. The role of ASOCT in analyzing the diagnosis of Descemet's membrane (DM) detachment in presence of corneal edema and its resolution post treatment has been very well documented. Jhanji et al. have reported a similar case which was successfully managed by conservative treatment. In our case, ASOCT findings confirmed that there was only edema with separation of the stromal lamellae without any DM detachment. It completely correlated with the slit-lamp findings. Balance salt solution (BSS) injection into stroma has been reported as one of the technique of deep anterior lamellar keratoplasty, wherein the BSS injected into the corneal stroma finds the path of least resistance and leads to detachment of the DM. Similarly, here in our case of accidental dye injection into the stroma could have also led to DM detachment. The management would then defer requiring surgical intervention such as intra-cameral gas injection. Thus the use of ASOCT not only provides the objective methods of follow-up but also helps us in deciding the treatment modality. We presume that the trypan blue from cornea would have disappeared through the natural drainage system of peripheral corneal lymphatics as confirmed by Singh et al. Though it does not require any surgical intervention, a good follow up and regular monitoring of the patient is necessary to document the course of events to allow for any intervention if necessary. In conclusion, one should be cautious in injecting trypan blue as it can stain the cornea if not injected carefully. Though rare, this complication could occur in the early period of cataract surgery training. Hence all the eye surgeons should be aware of this complication. This report not only highlights the natural course of corneal staining, the role of ASOCT in decision making and also provides the necessary measures to avoid the said complication. Jhanji V, Chan E, Das S, Zhang H, Vajpayee RB. Trypan blue dye for anterior segment surgeries. Eye 2011;25:1113-20. Balestrazzi E, Balestrazzi A, Mosca L. Deep lamellar keratoplasty with trypan blue intrastromal staining. J Cataract Refract Surg 2002;28:929-31. Norn MS. Per operative trypan blue vital staining of corneal endothelium. Eight years followup. Acta Ophthalmol (Copenh) 1980;58:550-5. Han S, Liu Y, Noriega KM, Mehta JS. Review article Clinical applications of anterior segment optical coherence tomography in cornea and ocular surface diseases. J Ophthalmol 2016:9. http://dx.doi.org/10.1155/2016/4971572. Chang YS, Tseng SY, Tseng SH. Comparison of dyes for cataract surgery. Part 2: efficacy of capsule staining in a rabbit model. J Cataract Refract Surg 2005;31:799-804. Melles GR, Waard PW, Pameyer JH, Houdijn Beekhuis W. Trypan blue capsule staining to visualize the capsulorrhexis cataract surgery. J Cataract Refract Surg 1999;25:7-9. Jacob S, Agarwal A, Agarwal A, Agarwal S, Chowdhary S, Chowdhary R, et al. Trypan blue as an adjunct for safe phacoemulsification in eyes with white cataract. J Cataract Refract Surg 2002;28:1819-25. Hurmeric V, Yoo SH, Mutlu FM. 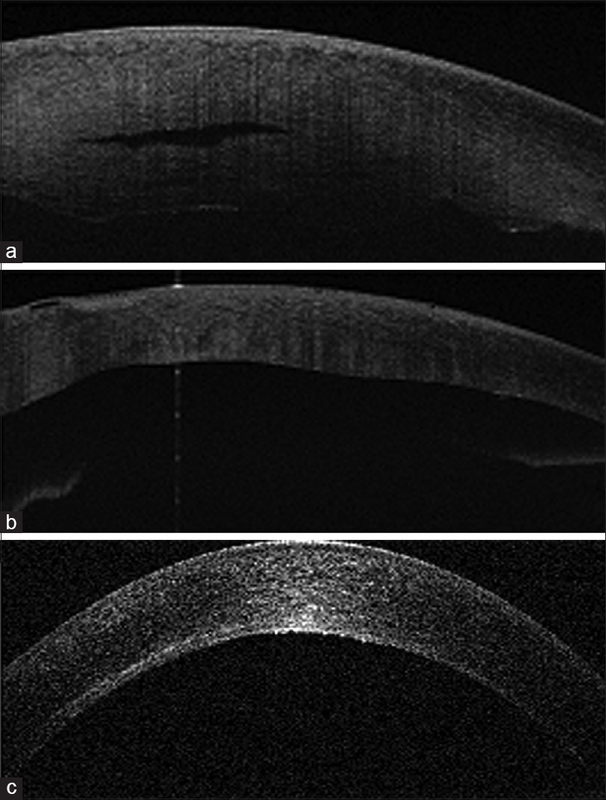 Optical coherence tomography in cornea and refractive surgery. Expert Rev Ophthalmol2012;7:241-50. Jhanji V, Agarwal T, Titiyal JS. Inadvertent corneal stromalstaining by trypan blue during cataract surgery. J Cataract Refract Surg 2008;34:161-2. Singh D, Singh R, Singh K, Singh S, Singh I, Singh R, et al. The conjunctival lymphatic system. Ann Ophthalmol 2003;35:99-104.